Art school can unleash your kids' vast imagination. Introducing art to your children at a young age is recommended creative activities are essential to early childhood development. While art helps stimulate the imagination, it can also keep your little ones busy. Art schools are a great places to channel your kids’ natural creative skills! Art school will allow your child to express themselves! Is art school right for your kids? Regular schools focus mostly on stimulating the left side of the brain, which controls logic. To help balance this, art is sometimes incorporated into kids activities during class time, especially in preschool. But is that enough? If you think your child has the potential to become the next Picasso, or you just want to introduce them to as many options as you can, think about enrolling them in an art school that offers programmes after school hours or during school holidays. Enrol your kids in an art school! Art can be anything that is a product of creative expression. It can refer to art classes that focus on drawing, painting, and crafts. When you enrol your kids in an art school, they will have access to a variety of art classes. As they progress, they can choose which medium appeals to them most and what they want to focus on. Some art schools take place in kids art studios, and some take place in a classroom setting. Membership usually includes the required art supplies, but if not you can pick supplies up from an arts and crafts shop or bookstore. Art schools usually run through the school holidays. If your kids would prefer a shorter programme, there are also art clubs for kids that hold weekly meetings weekly and casual sessions. 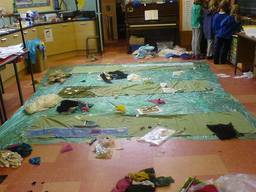 Some kids organisations also run art programmes like art camps, which usually lasts one or two days. If you want to take a more hands on approach and spend some quality time with your kids, you can enjoy art activities with them through an online art school. Online art schools provide art lesson plans so you can teach and supervise your kids while they get creative. Visit our ActiveActivities directory for more tips on art schools for kids in New Zealand, as well as other kids activities that your kids will surely enjoy. Foster the creativity in your kids by sending them to an art school!